Want to save money? Slow down! Everyone has probably started the New Year full of new hope, dreams and renewed energy. The personal finance blogosphere is full of great advice and ideas about how to save money this year. I will add another idea to the list, a little unconventional, but one that worked great for me – slow down! I had some health issues that forced me to shut down pretty much my entire schedule for the month of December. I didn’t think about saving money at all, but as I paid my bill for December, I realized that it was the lowest for all of 2011. I, however, never felt like I was actually doing anything to save money. I went through our credit card bill to see what we did differently in December. I took off from work, so I expected the gas bill to be low. But even factoring that in, I had to double check whether there had been a mistake. It should have been obvious, I didn’t realize how much of a difference there was when I was relaxed and not running around like a headless chicken. Pressured? Eat out. When we feel we have a deadline at work and feel pressured, we usually eat out. We won’t take the time to plan our meals and cook them ourselves. This not only affects our wallets but also our mid section. Unhappy? Shop more. There are several reasons to shop and one of the major reasons, even if we don’t admit it, is we shop when we are unhappy. For a lot of us shopping is a therapy to unwind and relax. No time? Pay for convenience. When you are exhausted do you really comparison shop? Personally I pick up the first thing I see that will do the job even if it is a high priced low quality item. I will let the cable or insurance bill run for several months without picking up the phone to check for quotes. I was totally relaxed and as a pleasant side effect, I didn’t spend much at all. How slowing down can save more more? Slowing down can save you money in almost every category. Save money on groceries and eating out : Taking time to plan out meals and not shopping in a hurry will save a good chunk in the food category. Save money on gas : Many times, by driving at the posted speed limit I feel I am a hazard to all traffic. According to fueleconomy.gov, due to aerodynamics and other conditions, a car loses 23 percent of it fuel efficiency when driving at 75 instead of 55 (and 28 percent at 80). At $4 a gallon, that’s a savings of 89 cents per gallon. Save money on insurance : Over 100,000 people a day receive a speeding ticket in this country. 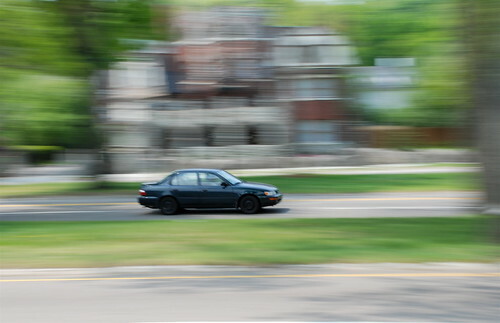 The average speeding ticket costs $150.00. The average raise in insurance costs for one speeding ticket over the course of 3 years is $900.00. And add in the fact that we are too busy to comparison shop insurance, that’s a lot of money. Save money by not impulse shopping : The more relaxed we are, the more thoughtful we can be when buying anything. We are entering the time of the year that is hectic for most people. When our to do lists get longer and calenders fill up, it’s hard to resist the temptation to race around. Slowing down may be counter-intuitive, but it is good for our wallet and for our sanity. By slowing down, we might even be able to check things off that list even faster. I definitely need to start slowing down, that’s the main reason I spend. I agree that we spend too much in crunch time. My wife and I avoid this by cooking two big meals on the weekends (saturday night and sunday night). Then, we eat leftovers throughout the week. There’s nothing easier than microwave – and it’s cheap. great tips – i also have found that when im really busy or running around a lot, I eat out a lot more, which gets expensive quick. Great discovery. (I hope you are feeling better now.) Sometimes I make decisions based on which choice will give me less stress. I go for less stress as much as possible. A lot of times that means we don’t go somewhere or do something. Winter is a great time for cocooning anyway! All I need is a cup of tea and warm socks! I am so with you on this. My husband has been on holidays for a few weeks and it is amazing the difference it has made to our finances. I knew our petrol would go down, but I had no idea how much he was spending on junk food to and from work as well. That combined with me being less stressed trying to combine my work with looking after our kids and doing all the running around has resulted in massive savings on many levels. It is amazing what slowing down can do. These are all awesome reasons for slowing down in our financial craziness. You’re right, we spend a TON of money when we’re in a hurry. As an aside, I love the font that you use for your blog. It’s very very stylish. I’ve pretty much taken spending to a grinding halt lately. It’s not because I don’t have the money or that I’m trying to do one of those “no spend” months, just that I haven felt any inclination to go out and do any shopping (or sit at the computer and do any for that matter). I think slowing down and assessing any decision is a rational and smart way to approach anything, not just spending money. Sometimes we would change some of the things we say and do in hindsight, and many of that can be resolved by taking a moment to consider what we are about to do before doing so. I’m definitely guilty of wasting money on convenient groceries or eating out. I’d say I’m on the slower end when I do end up driving, so hopefully I’m saving money there. Lots of good points here on how slowing down can help in several different ways. I think that this realization is important — that slowing down and simplifying can really make a difference. Being home more makes you appreciate what you have, too, verses what the stores on your route to work are selling. This is something we all need to keep in mind when it comes to minding finances. It’s a great idea to plan ahead every weekend for purchases you know you will have to make during the week. When you come to something you didn’t plan for, wait a day or two to see if you really need it. Often this question is answered automatically when you forget about it before two days is up! Great concept… and you’re right. Simply slowing down a little can save money in lots of ways, as you mention. I think eating out rather than packing lunches, etc. is a very difficult temptation to overcome. I think fuel consumption drops to 3L/100 if I drive at 60 as opposed to 120 where it is 7L/100. So, my gas consumption is less than half though it takes twice the time, and I would never drive that slow on the freeway due to safety. IIRC, statistically speaking, you are safest if you go *slightly* faster than prevailing traffic. Itâ€™s a great idea to plan ahead every weekend for purchases you know you will have to make during the week. Sunday Link Charity #6 â€“ Best of Personal Finance From This Week!